When purchasing web hosting most of the people look at overall quality of service, price, and quality of support team. Sadly, it's very hard to find a hosting that offers all of that properly balanced. We at Servikus decided to step up and break the rule which states that good quality must come with a high price. What we offer is top quality hosting, accompanied with an amazing support team, and all that at more than affordable price. After long time of working, extensive testing, and tweaking we have set up a great hosting solution for both experienced webmasters and people new to web business. If you are looking for an affordable shared hosting prepared to handle small and medium amounts of traffic, than look no further, we have everything you might ever need. This is SSD powered hosting in combination with regular HDDs.This way we are able to keep the perfect ratio between SSDs speed and HDDs large capacity. 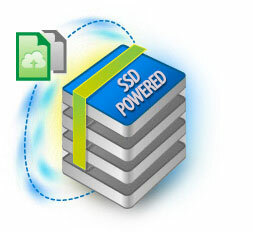 This SSD/HDD combination is tweaked to provide the best possible speed/capacity at surprisingly low cost. As we all know SSDs run up to 6 times faster than regular HDDs. We set up a system where HDDs will satisfy the need for bigger storage capacity, and also having SSD's which provide much greater speeds. Our servers run on award winning LiteSpeed Web Server (No1 commercial web server). LiteSpeed is compatible with all popular Apache features, such as: mod_rewrite, .htaccess, mod_security, and more. Also LiteSpeed provides greater speeds than Apache. So you will get all of the functionality Apache offers but at much greater speeds. We use CloudLinux which provides a VPS-like environment with account isolation. This way we are providing a secure environment for your website and making sure that any possible attack on other accounts hosted on same server will never negatively affect your account. Your website is as safe as it gets with us. You will have an option to select a PHP version and PHP modules with just a couple of clicks. We made switching between PHP version and further PHP tweaking easier than ever. You will also get access to very popular Softaculous One-Click script installation, giving you the ability to install more than 300 popular scripts with ease. Installing Wordpress takes just a couple of seconds, and it requires absolutely no previous knowledge of setting up databases, users, permissions, etc. You will also get exclusive free access to a variety of SEO and Marketing tools powered by, world's largest SEO company Attracta. 30 Days Money Back guaranteeIf you are not happy with our service within first 30 days. We will refund all your money.